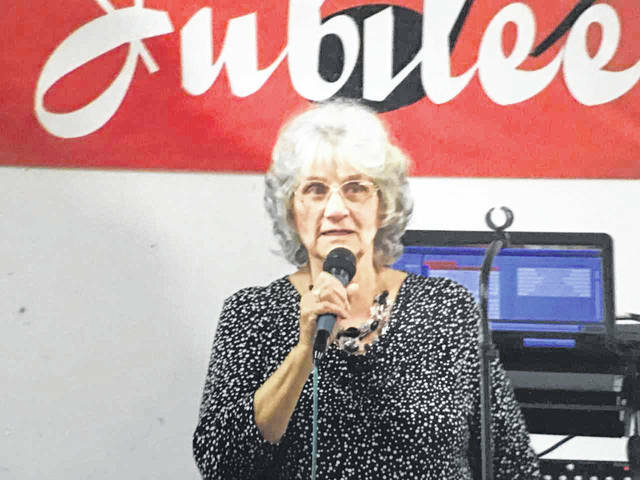 Evelyn’s Birthday Bash, one of the largest fundraisers for the annual Bend Area Gospel Jubilee, will be held March 23, 5:30 p.m., at the Father’s House Church fellowship hall in Hartford. Pictured is Evelyn Roush, jubilee promoter. HARTFORD — Her birthday is probably one of the most recognized in the county, but the party she hosts annually for herself is anything but self-serving. “Evelyn’s Birthday Bash” is held by Evelyn Roush each year. She asks for those attending to bring her a card with a cash donation. But as the longtime promoter of the Bend Area Gospel Jubilee, all funds raised go to the weeklong gospel singing event. In fact, the bash is now one of the largest fundraisers for the jubilee. This year’s birthday bash will be held March 23 at the fellowship hall behind Father’s House Church in Hartford. The event will begin at 5:30 p.m. with a potluck meal. Those attending are asked to bring their favorite food, enough to share, with table service being provided. Entertainment will follow by “Gramps and Giddy Up Go Gang.” Singing will be featured by Evelyn’s niece, Rhonda Smith, and her sons, Cody and Ethan, who make up the group “Covered by Love,” of South Webster, Ohio. Others will also be singing throughout the evening, and door prizes will be given. The 29th Annual Bend Area Gospel Jubilee will be held June 3 through 8, with over 50 artists set to perform. Evelyn began promoting gospel music at the age of 11, after being encouraged by her parents, Cecil and Eunice Martin on Mission Ridge. She formed the jubilee with other music lovers in 1990. Growing from a two-day sing to a full week, Evelyn said one must know God is in the plans. The jubilee was first held at the West Virginia State Farm Museum near Point Pleasant, but moved to the Jackson County Junior Fairgrounds in 2004. There, the covered stage and camping facilities make the event welcoming for the people who travel from various states. For more information on the birthday bash or gospel jubilee, contact Evelyn at 304-882-2049.